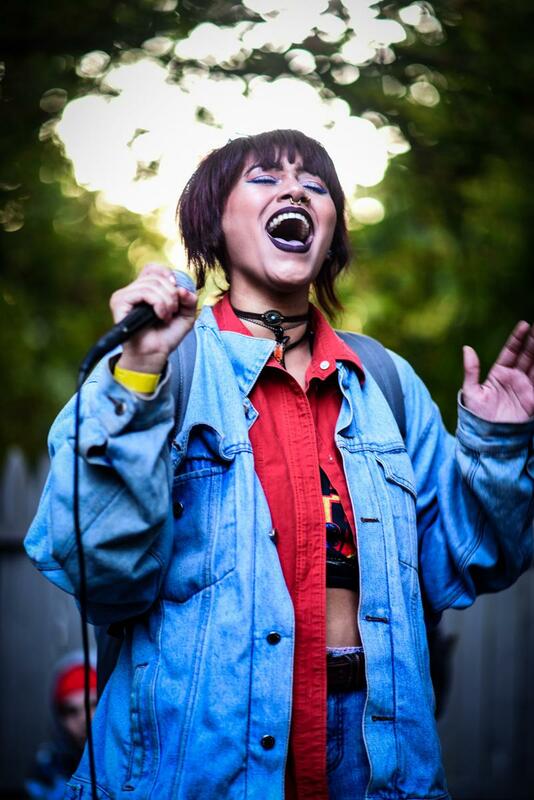 Local freestyle artists and producers got together Saturday, Sept. 9 to share their talents at 9Fest, a house show in Kent, and A Magazine got an inside look at how these artists got started and continue to grow their fan base. A Magazine: Did you get started in Kent? Alfredo: I did, officially, at least. I had been rapping for fun with friends since middle school in Maryland, but I really got down into production and actually developing my brand during my sophomore year at Kent. A Magazine: How did you get started financially? Alfredo: As many others in this college town, I tried a lot of free trials and programs. Luckily, I had my basic college laptop and a bunch of free audio plugins and things that friends could spare. It was only after a couple of months of steady production and finding my rhythm that I finally bought a Numark DJ Controller and more advanced synthesizers like Sylenth1. I try to drop money on essential software and equipment, but I’m definitely on a cheap college budget still. A Magazine: What worked and didn’t work about getting started making music? Alfredo: When I first started producing, I attempted to mimic larger and more well known songs, and a lot of times I would just become impatient with trying to achieve a certain sound or melody. What eventually worked, even through my impatience, was going back and covering all of the essentials like music theory and mixing/mastering, even though it seemed to take longer and wasn’t as glamorous as making a hit track immediately. Gabriel James: Getting started making music, I didn’t know really what my sound was or anything. I just made some songs I thought other people would like, which got me some attention starting out. As I started making more music, I started to gravitate more towards my sound and what I liked and also what reflected how I felt about certain situations and just a release of inner conflicts that I had. So it was not only the best music I was making, but therapeutic. Some people that liked me before didn’t really like it and stopped supporting me, which is okay, but the ones that stuck with me through this transition started to like me even more and got me more attention and more support. I realized that what didn’t work was trying to make music to impress others, and I realized what did work was expressing myself in my music because I’ve been fortunate to gain not only fans, but friends that understand my struggles and see my music as a stress reliever and a reflection of themselves. A Magazine: How are you able to expand your business and fanbase? Gabriel James:Trying to expand my fan base and the K9INE brand was always something I’ve tried to do. And I’ve studied other successful people do their thing and used their pathway to success as a roadmap of what I should do, but everyone is different. I spread my music through social media, and after the recognition I got, we made K9INE tshirts and I did photo shoots in them, and even my girlfriend modeled in them. People liked it and we sold a lot, and now every show I’m at we bring them to sell, which definitely brings in revenue. People wear them throughout Ohio, and even my family around the country starts to get a buzz going, asking what the K9INE brand is. So not only does my music help my image, the K9INE merchandise helps as well. A Magazine: What marketing tactics do you use to promote? Gabriel James: Marketing tactics I use take more of the social media route. Twitter, Instagram and Snapchat are the ones I use the most. I promote on there and get a talk going. I reach out to other music pages online and get them to promote my music and get people who I wouldn’t be able to reach out to a chance to listen to me and rock with me. So social media is my main source of getting myself out there. My Twitter, Instagram and Snapchat username is “gabekovats.” Please go give it a follow to stay updated on everything about my music and K9INE. 4AM: I didn’t start in Kent. I started in my home town in Ashtabula and just brought my talents with me when I moved down to Kent for college. 4AM: What really worked for me about starting to make music was the ability to put out consistent content week after week. I personally feel like being consistent with anything you do has a huge impact on whether you will succeed or not. What didn’t work for me at first was the ability to establish a fan base. Being from Ashtabula, Ohio, not a lot of people show positive support to other people when it comes to making music, especially rap music. 4AM: Eventually, I put out enough content and people actually started to pay attention. Money wise, I started out really rough. I was only 15 when I started making music and putting it out on Myspace and Facebook, so I didn’t really have a job and I was too scared to ask my mom to buy equipment and other musical related stuff for me. So I just worked with what I had. I used an old rock band mic, some broken headphones from Walmart and just a regular Windows computer. Over the years, I saved money and was able to actually build my own computer so it was able to run a ton of software to help make my music and my brand better.